Jean writes: I tried the new modern look for Gmail and it’s too modern for me. How can I get the old look back? Hi Jean! First, the bad news: like it or not, it sounds like Google will be rolling out the new Gmail makeover (which I quite like, actually) for everyone in the near future—and once that happens, there’s no going back. 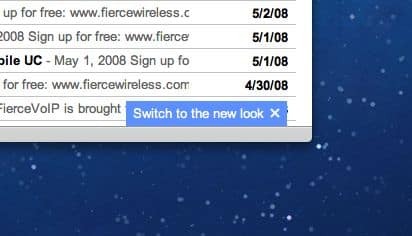 That said, if you switched to the new Gmail look early (by clicking the “Switch to new look” button in the bottom-right corner of the interface), there is an option for turning back the clock—temporarily, anyway. Update [4/19/12]: Well, it looks like Google has finally pulled the “revert to the old Gmail look” option. That said, you can always try the bare-bones version of Gmail, which at least resembles the classic Gmail inbox. There are also options for changing the look and feel of your “new” Gmail inbox. Yes, you can be back to the old Gmail look, but only temporarily. Go to your Gmail inbox, find the gray gear icon in the top-right corner of the screen that’s just below the black navigation bar (and not the little gear icon that’s actually in the black bar), and click it. Select “Revert to the old look temporarily,” then click the blue “Revert to the old look temporarily” button in the pop-up that appears. Next, you’ll be asked to fill out a short survey about why you want to go back to the old Gmail look. Among the options you can click: “I don’t have time to learn the new look right now,” “I tried using the new look and didn’t like it,” and “Based on what I read or heard about the new look, I don’t want it.” Select an option, add more detail if you like, the click the blue “Submit” button at the top of the page. Presto—your Gmail inbox should (repeat, should) sport the old look again. In the row of tabs that starts with “General,” find the “Themes” tab to the right and click it. Select a new theme—any theme will do—wait for the “Your preferences have been saved” message to appear, and then click your preferred theme again. That little tweak worked for me, but if you’re still having trouble, post a comment below. 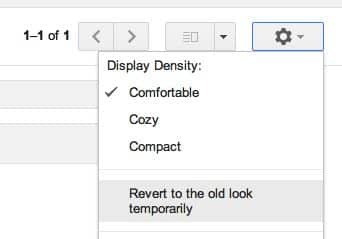 For details on the new Gmail design and features (including a revamped search box and a new toolbar), click here.